This series should be a staple of the DC. It should always have an ongoing. Thanks. Yeah your right. #4, #22 and #31. Pretty sure a ton more characters debuted in Showcase. Suicide squad, doom patrol, challangers of the unknown, metamorpho. Gotta check it up though. i guess hal, barry and ray were the most popular of those that got showcased... and suicide squad. glad they stuck with us, unlike the new age of heroes that seem to be having little impact. Jeff Lemire wrote an Atom story with his classic costume? Was this pre-New 52? I'm not sure if this particular story was a part of this arc, but he wrote Brightest Day: The Atom Special back in 2010.
so is this from brigtest day the atom special? Ohhhhh yeah!! I have read that and it’s fantastic! lol! a giant size atom special. i like it. 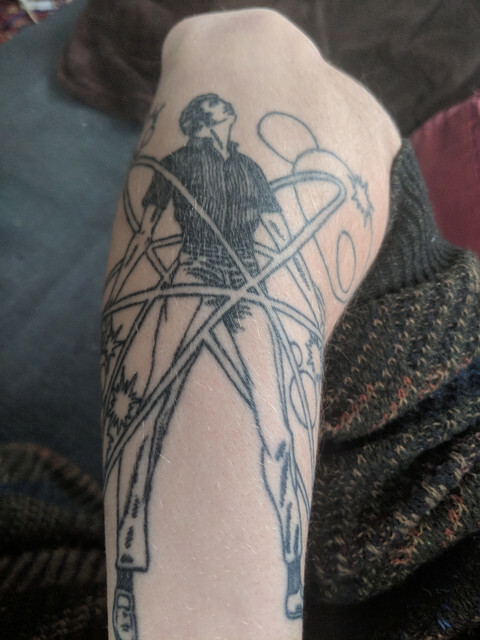 Hey y'all, this is a Ray Palmer / Atom tattoo I got back in November done in the style of Gil Kane. Been a while so wanted to share!